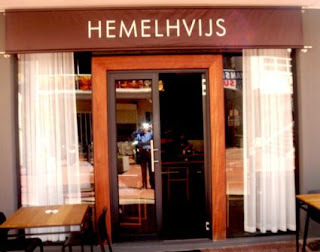 There is a new restaurant in the city, Hemelhuijs at 71 Waterkant Street, the latest manifestation of Jacques Erasmus' creative spirit. He has chosen the location well. Surrounded by buildings whose facades have been restored to reflect their former glory and in sight of the World Cup pedestrian bridge, one is immediately awake to all sorts of possibilities. Jacques flair and talent in their many incarnations have graced our city for quite a while. This purveyor of beauty and style has always been a trendsetter. He has started restaurants for himself, Manna Epicure in Kloof Street and Serenity Spa in Mouille Point where he was the executive chef. He has conceptualized restaurants and their food for other people wishing to emulate his artistry and inventiveness. The Simonsig Cuvée Restaurant is one such example. He has designed and created amazing chandeliers that hang in the Cape Grace and in the restaurant at La Motte, Pierneef á la Motte. These creations have to be seen to be believed. He has his own interior design company, Hemelhuijs and 'oh yes' he says as if by the way,"I write for Taste Magazine in the Trend section." A photograph of one of his beautiful food creations adorns the cover of the October issue of the magazine and frankly, that was the reason I bought it. So where does his work end and his life begin? Well it doesn't. His work is his life. He has a studio at home which is the birthing place of his visions. He has designed everything in the Hemelhuijs restaurant all of which can be ordered for puchase. The chairs and tables of sand-blasted oak and black epoxy coated steel are skillfully designed to provide maximum comfort. The bar at the back of the chair is just slightly rounded to fit into the contours of one's back. The home- ware on display is his art. Gorgeous matte black ceramic pieces and light fittings. Lovely deep plates that are numbered and stamped; earthy coloured shapes that one could use as decoration or maybe as a vase with a single flower or wherever your whim takes you. 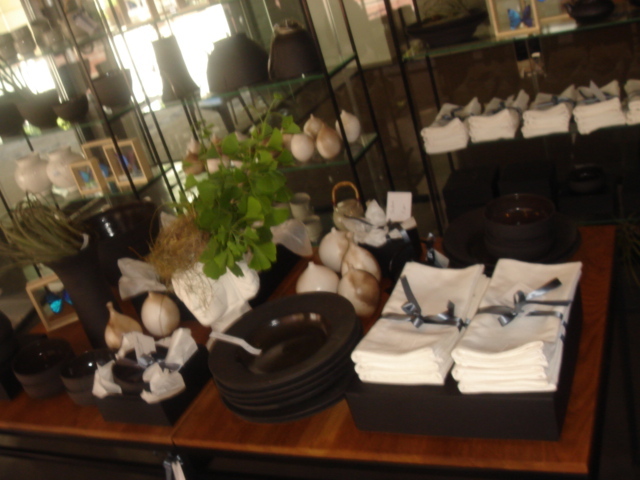 Beautiful white linen napery displayed in black boxes is almost too much to resist. 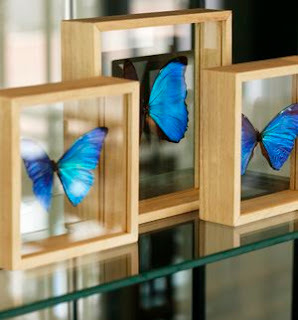 For me, the pièces de résistances are the sapphire blue butterflies mounted in perspex. Turn them around and they are a totally different colour. 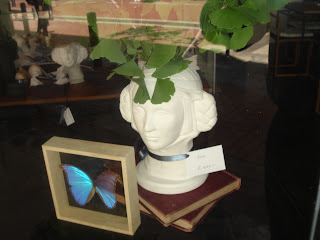 A natural holograph! 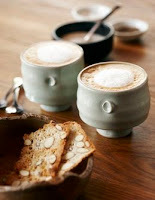 The restaurant is a breakfast and lunch place and of course coffee or what you will all day. The trim menu is printed on white cardboard in the minimalist style that Jacques favours. On our first visit, Eugene and I tucked into the Caesar salad which according to Jacques, has always been his signature dish. Delicious crisp lettuce, crunchy garlic croutons, parmesan to tantalize the palate and a light anchovy dressing which allows the taste of the anchovies to peep through without being horribly salty. This is served with chicken and crispy bacon and presented in a very generous sized wooden bowl. The salad is easily a meal in itself to be enjoyed with the excellent bread that is brought to the table. Jacques has an artisanal baker that supplies his delicious bread. Exquisite oriental- patterned bread plates, all different, are just another touch of specialness in a very special place. 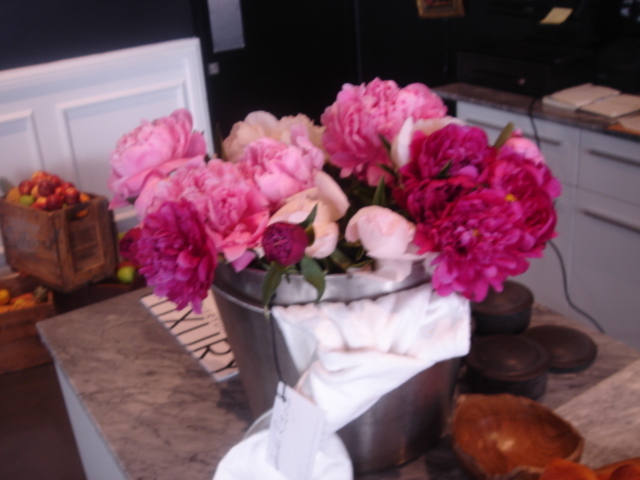 The menu changes constantly to take advantage of seasonal produce. A veritable moveable feast. On our next visit I enjoyed a spectacular dish with fresh artichokes. Two plump poached eggs with juicy artichoke hearts, a superb prosciutto and a subtle, lemony hollandaise, what a treat! Eugene ordered the soft scrambled eggs with salmon and toasted apple cake. Again, bread was brought to the table accompanied by the beautiful oriental side plates. 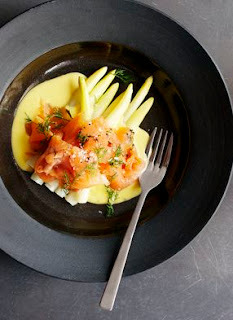 I mopped up every scrap of the hollandaise sauce and Eugene made short shrift of the delicate combination of tastes on his plate. Everything was cooked to perfection, all lovely, all delicious. Jacques declares proudly that the ingredients that he uses are 99% local. The menu includes choices of crostini with ciabatta or rye bread. Combinations like 'duck liver paté with preserved orange' or 'salmon with fresh pear, watercress and citrus crème fraiche' and much more to tempt and tease the taste buds. Try a Hemelhuijs 'burger' with creamed mushrooms and a poached egg, or 'slow roasted lamb ribs with coriander seeds and hoisan sauce'. 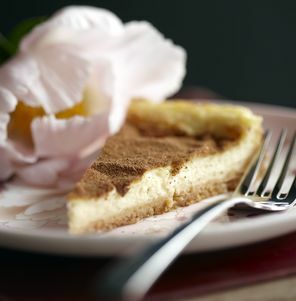 There are delicious salad options for vegetarians and of course, the superb cakes that are baked in the restaurant. These cakes are a side-show in themselves. 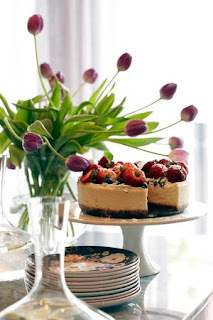 Displayed on cake stands or in great glass bells, they are a mouthwatering sight. Melktert from Jacques' grandmother's recipe, apple cake, chocolate cake, almond and pear tart or almond with peach or nectarine. A cup of superb coffee, hand selected fine tea or white hot chocolate with vanilla, accompanied by a really generous slice of any one of these delicacies is a lovely way to end a meal. There is a selection of four boutique house wines, which can also be ordered by the glass, beer or glorious exotic long drinks that are a sight to behold. Pimms and lemonade with cucumber and green tea, campari with orange and hibiscus tea and fresh apple juice with gin and tonic. Jacques talks about his hope that the 'ladies that lunch' will eventually come to enjoy Bellinis with nectarine and peach purèe that he is planning for the summer. Oh yes! oh yes! oh yes! There is a lovely selection of freshly made juices for those that have to get back to work and I imagine that these will soon be enhanced by ripe and juicy summer fruit. Address: 71 Waterkant Street Cape Town. Eugene and I love eating out and we always pay for ourselves whenever and wherever we go.